From left to right: Leo Chu (CE ‘20), Soham Patel (ME ‘20), Gian Tria (EE ‘21), Daniel Kim (ME ‘21), Dave Chun (ChE ‘19), Sam Lee Mee (ME ‘18), Sun Kim (ChE ‘18), William Chen (EE ‘20), Jason Yao (ME ‘18), Chris E (EE ‘19), Sergey Kolchinskiy, Misha Luczkiw (EE ‘19). Photo by Jeff Tam. After our win against Pratt, it was time to face the CIA, the Culinary Institute of America. On a cold 4th of March, right after the snowstorm had hit, the team got on the iconic yellow school bus and the three-hour ride toward Poughkeepsie commenced. Our driver asked our coach, Sergey, if he could read her the directions she had printed in backwards, because she had only printed them for coming back. The farther north we went, the colder it got. The bus was silent, and everybody was struggling to keep themselves warm. The windows on the side wouldn’t shut all the way. Without saying a word, captain Chris E. handed me some finger tape. I got the hint and taped my window shut. Engineering 101. We got there frozen, and had to hurry warming up. The unwritten rule at CIA is that if we win, coach pays for lunch. CIA is a very manageable team; not a lot of height, they’re pretty disorganized, and their one talented player can barely reach the top of the net. So, we got off to a commanding lead in the first set, CIA’s disorganization taking its full shape, and the set was soon ours with a clean 25-17. The second set, however, was a different story. CIA gave us a taste of our own medicine by demolishing us 13-25. Coach gathered us and said: “Okay, okay, just forget this set. It didn’t happen, okay. When we win, it’s gonna be a clean 3-0 set victory.” In sports, but also in life, the ability to “forget without forgetting” is important. It lets you bounce back from adversity without being anchored down by the mishaps of the past. We had underestimated our opponent, but we were not going to be fooled again. 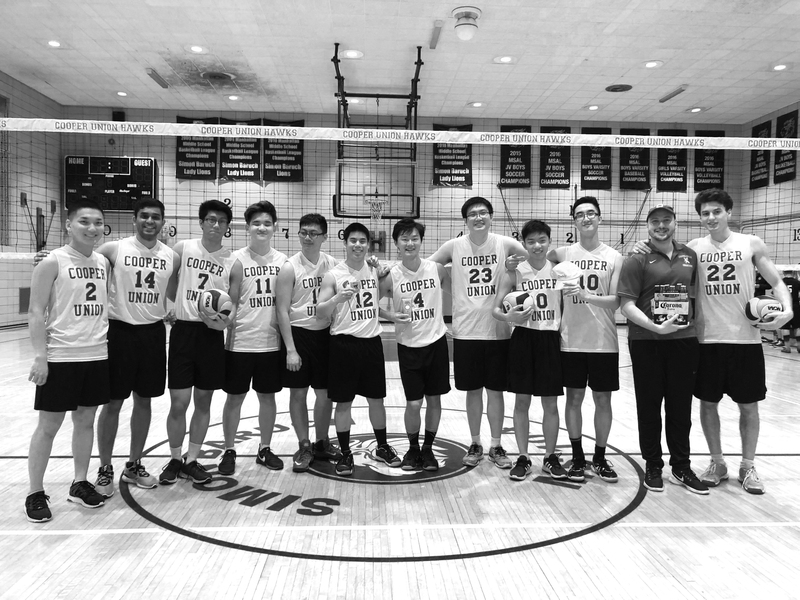 In two very hard-fought sets, our technique and mental grit proved too much for CIA. So, a ‘clean’ 3-0 straight set victory meant the team could delight in the exquisite cuisine offered by the Culinary Institute. 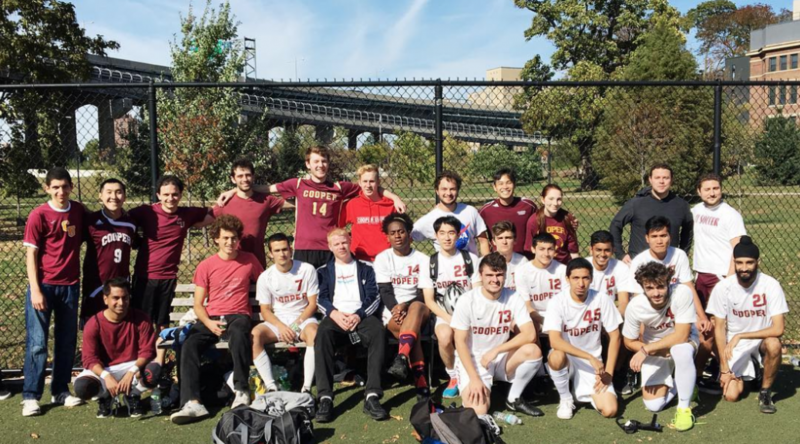 Next up was our home trimatch on March 24 against CIA again and the Webb Institute, a naval architecture and marine engineering college in Glen Cove. This was the last competitive home game for the seniors Sun Kim, Sam Lee, Jason Yao. The final 3-0 result against CIA doesn’t do justice to how narrowly we overcame them. In the first set the home court advantage proved decisive, with CIA still adapting to our low roof and with a clean 25-21 the set was ours. CIA came back strong and in the second set we were trailing by more than 5 points for most of the set. Coach called in a few key timeouts to disrupt their momentum. In the end, CIA seemed to always choke right before the end of the set, and without being asked twice we stole the next two sets 27-25 and 26-24. Webb brought the equivalent of three teams with them, so coach did the filtering for us and highlighted their main threats: “Look out for number 13, the tall guy. Their setter will set anything, so don’t take anything for granted from him.” And of course, their most recognizable player, which I called the ‘Jesus-looking guy’ due to his very long hair and thick beard, had turned into another player altogether, improving every aspect of his game. The match against Webb was a back and forth of punches. We delivered the first hit with a 25-22 win in the first set. Webb came back with fire and fury, and gave us a relentless 12-25 beating in the second. The pressure was on, the intensity was high, and both teams had raised their level. In dramatic fashion, we took the third set 25-18. In the final set, senior Sun Kim, who had been suffering a knee injury, changed his libero shirt to come as a power spiker as a farewell to the team. The last set was a festival of spikes from every direction – Dave from power, Sun from power, Soham from the weak side, me from the back-row, Chris E from the service line – which in the end proved too much for Webb who conceded the final set 25-22. After our victory, the ritual senior gifts followed. On behalf of the team I want to thank all those who came and supported us. It is such a pleasure and joy to play in front of you. The atmosphere is charged by your presence and I will personally cherish the memories I take away from these matches. And we did. We played with a 3-5-2 formation: Wei goalkeeper, Kyle, Armaan, and I in defense, Peña, Enea, Nick, Justin and Leart in midfield, and Alfred and Gabe up top. King got an early opportunity with a dangerous header in the middle of our area. I managed to kick the ball out before one of their strikers could tap it in. From then on, though, we were pressuring them. Corner after corner and shot after shot, we kept them on the defensive. After a long absence from the team, Casey, our star striker, was subbed, and he did what he does best, create goals. Dribbling through three of King’s defenders, he set the easy tap in to Leart. Simple, clean football, and it was 1-0 for us. King was quick on the counter attacks, and, in a scramble play, their number 10 player dove in our penalty area. The ref gave them the penalty, King capitalized, and we were back to level, 1-1. The game ended 4-1, which was beyond anyone’s wildest predictions. We all came into the game expecting a sure loss. But I think that attitude loosened us up, since we had nothing to lose. We’ll be back in action in a few weeks for the Alumni Game on Saturday, April 14th, so stay tuned.